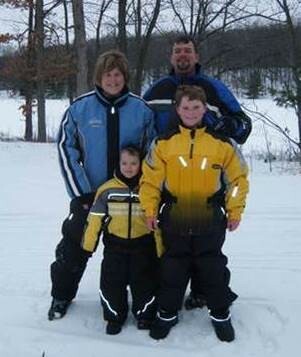 Ele's Place has had the honor of serving grieving children, teens and their families across Michigan since 1991. Ele's Place's commitment to providing for the needs of grieving children is possible only because of the generosity of the communities we serve. Thanks to our dedicated weekly volunteers, in-kind donations, service projects of other community organizations, and financial contributions, Ele's Place is proud to offer all programming at no cost for participants. Ele's Place would like to thank YOU for supporting grieving children and teens throughout our communities in Ann Arbor, Flint, Grand Rapids and Lansing.The impact of your generosity is profound! In the past year, our staff and volunteers helped thousands of lives through support groups, school-based programs, clinical consultations, and community education. Les Rogers and his two sons, Matthew and Mitchell, came to Ele's Place after the death of their wife and mother, Shawn.Click HERE for a short video of Les and his boys sharing their inspiring Ele's Place story. Please help us continue to support families like the Rogers. Click on the links found below and to the left to learn more about ways to join us in our mission to make sure no child in Michigan grieves alone. Ele's Place programs would not be possible without the support and involvement of community members who care and make a difference in the lives of grieving children. Find out more about volunteering at Ele's Place, view our online wish list, or support families with a secure, online gift. Make a donation today and help many other grieving families who come to Ele’s Place each week. Monetary donations made to Ele's Place remain tax deductible under the State of Michigan tax law.